​I am extremely excited to announce a major new update for Plague Inc. in partnership with 20th Century Fox. 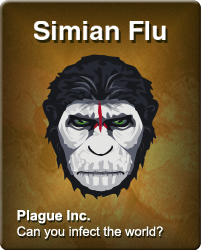 Get ready to infect the world with the Simian Flu from upcoming summer blockbuster movie Dawn of the Planet of the Apes! 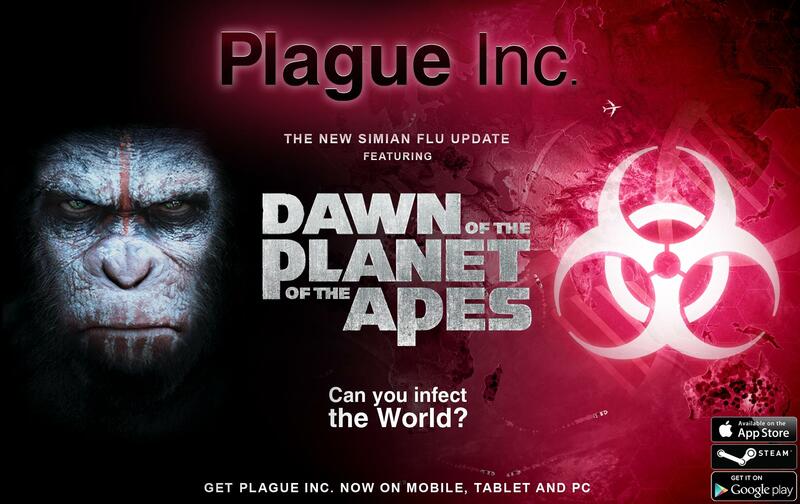 The narratives of Plague Inc. and Dawn of the Planet of the Apes fit together perfectly and result in an incredibly powerful new plague type for new and existing Plague Inc. players to enjoy! Experience Planet of the Apes on a global scale - See how humanity responds as you infect the world with a lethal, artificial virus. Can they handle a global pandemic while dealing with a growing nation of genetically evolved, intelligent apes? Control communities of intelligent apes – As well as infecting humans, evolve your disease in parallel to allow ape-to-ape transmission and improve their cognitive abilities. Ape colonies will generate DNA whilst helping apes avoid detection from humans. For one species to rise, another must fall? – Master new gameplay mechanics and strategies to help apes become the dominant species on the planet. Decide when your apes should rampage against research labs, move apes to avoid detection from military drones and use ape migration to prevent scientists from conducting aggressive ape experiments. The update is coming to Plague Inc. on iOS and Android and Plague Inc: Evolved on PC & Mac. It will also be included in the future Xbox One edition of Plague Inc: Evolved. It will be initially be available in English, Japanese, Korean, Chinese (simplified/traditional), German, French, Russian, Spanish, Portuguese and Italian. P.S: A fun fact – when I was making Plague Inc. (as a hobby) 3 years ago – I was watching the previous film Rise of the Planet of the Apes and the end credits scene gave me a lot of inspiration for Plague Inc. (it features a disease slowly infecting the world) Crazy to think that Plague Inc. is now big enough to work directly with the film’s sequel!